Over the course of the last 5 years, December, January and February have rather kind compared to 15 years ago. What we are currently seeing is erratic changes, one day above freezing in a matter of hours freezing, and it seems to be oscillating back an forth. Next year will tell a story, This year followed closely the same pattern of Snow, rain, freezing sequence. As of today probability of a spring flood of the Saint John River is highly unlikely. Ottawa – The Prime Minister, Justin Trudeau, today announced that he will travel to New York City from April 20 to 22, 2016, to sign the Paris Agreement on climate change. Canada has committed to play a positive and constructive role in the world, and to make meaningful contributions to important global challenges such as climate change. In November 2015, Canada and 194 other countries reached the Paris Agreement— an international agreement to address climate change that is ambitious, durable, and applicable to all parties. It recognizes the important role of subnational governments, civil society, and the private sector, and it highlights Indigenous, community, human, and gender rights. During his visit, the Prime Minister will also discuss the issues of climate change and youth engagement with students at New York University, and meet with counterparts. Canada has resolved to be an international leader in the low carbon global economy over the coming decades. The government will continue to work with our provincial, territorial, and international partners to develop a more coordinated approach to climate change, so that our children and our grandchildren can enjoy a world more prosperous and sustainable than the one we know today. The Prime Minister, Justin Trudeau, and provincial and territorial Premiers met today with First Nations, Inuit, and Métis Nation leaders on the traditional territory of the Coast Salish people to discuss how they can work together, in the spirit of the renewed relationship, to address climate change and promote clean growth. Across the country, communities are facing new challenges as a result of climate change. During the meeting, Indigenous leaders outlined a path forward for partnering to stimulate clean, sustainable economic growth – while also ensuring our land, air, and water are protected for future generations. The knowledge and ideas shared by Indigenous leaders will inform the Prime Minister and the Premiers as they meet tomorrow to discuss the development of a pan-Canadian framework to address climate change and create clean growth. They discussed effective ways for Canada to adapt to new challenges, reduce emissions, and capitalize on the opportunities presented by a low-carbon economy to create jobs. The Prime Minister looks forward to collaborative work with Indigenous leaders and Premiers on clean growth and climate change. To discuss all of this I’m joined by a two-member panel, Dahr Jamail and Guy McPherson. Dahr Jamail is a staff reporter with TruthOut. He currently focuses on the environment and climate change. And Guy McPherson is Professor Emeritus of conservation biology at the University of Arizona. Thank you both for joining us today. DAHR JAMAIL, INVESTIGATIVE JOURNALIST AND AUTHOR: Thank you. It’s an honor. JAMAIL: It’s because a phenomena is occurring called abrupt climate change, and it’s actually something I started to really become acutely aware of back in 2013, and became aware of Dr. McPherson and his work and conducted a long interview with him, and wrote a long article for TomDispatch.com called Are we already off the climate precipice?. And you read the article and the answer is clear, yes. And the fact is, when we look at, connect all the dots, which Dr. McPherson has done and has been doing for quite a number of years now, that it shows when we look at the pattern of for example the IPCC worst case predictions of, whether it be temperature increases or sea level rise, or CO2 in the atmosphere, the reality continues to dramatically outpace the worst case scenarios. And so the worst case scenarios in the modeling keep being amended with more new data coming in, and the reality is that the reality keeps outpacing it to the extent that even the modeling can’t even keep up. And we’re seeing things happening on such a fast pace now regarding extreme weather events, 1,000-year floods turning into 100-year floods turning into 10-year floods. Same with fires and temperature increase records, and all of this is happening so quickly and dramatically that there’s no question that this has been going on for years now. What: Toronto based lawyer and founder of the not-for-profit organization “Our Horizon” Robert Shirkey will be giving a public lecture about a proposed bylaw that would require gasoline retailers to place climate change and air pollution information labels on gas pump nozzles. This proposal was made to the Public Safety & Environment Committee for the City of Fredericton on November 4th, 2014 (http://bit.ly/1LNFMkM). When: Tuesday, 24th of February from 6:00 to 7:30 pm. – Climate change is one of the greatest challenges of our time. We must reduce our consumption of fossil fuels to ensure a stable climate. – The proposed labels are an innovative way to link our consumption of fossil fuels to the impacts of climate change right at the point of purchase. The idea challenges the status quo and contributes to the creation of social conditions that favour reform. – Cities such as West Vancouver, Berkeley, and San Francisco have voted to pursue this idea. 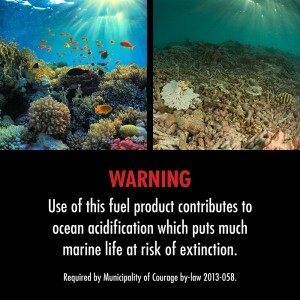 Who: Our Horizon is a national not-for-profit organization that is asking municipalities to pass bylaws that would require climate change and air pollution information labels on gas pump nozzles. The campaign was launched by Toronto-based lawyer Robert Shirkey in 2013 and has already attracted interest from all over the world. To learn more, please visit www.ourhorizon.org.